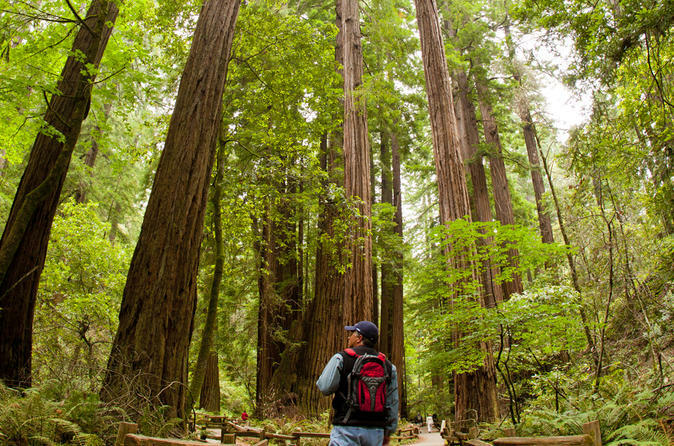 See Marin's world-famous redwoods without the crowds on your moderately strenuous, 3 to 4-hour, guided small-group tour. Access the iconic redwood groves of charming Mill Valley on foot and navigate the quiet trails following the fern-lined canyons at the base of Mt. Tamalpais. Experience cathedral-like ancient trees in a primeval creek-side setting and explore the redwood groves for about two and a half hours. The walk begins with a shuttle from the ferry landing in downtown Sausalito (ferry ticket not included) and then a stroll through Mill Valley's historic downtown before heading out into the redwood forests and park-like neighborhoods. Your tour begins at the Sausalito ferry landing (which you can reach via a 30-minute ferry ride from San Francisco's Ferry Building, at your own expense). You'll be picked up here and taken to the base of Mt. Tamalpais to walk to a waterfall and back. After a stroll through Mill Valley, head on an easy-going walk to a redwood-forested canyon lined with beautiful homes and walking paths. Your invigorating hike is a wonderful way to see these majestic and ancient trees in a pristine creek-side setting. Your hike captures the natural beauty of Marin and Mt. Tam at its best! Tour guides are native San Franciscans and local residents with a deep knowledge of the region's natural areas.